So far we have shown you how to setup a classic dual-boot for Windows 8, and we even showed you how to do it without creating a new partition. 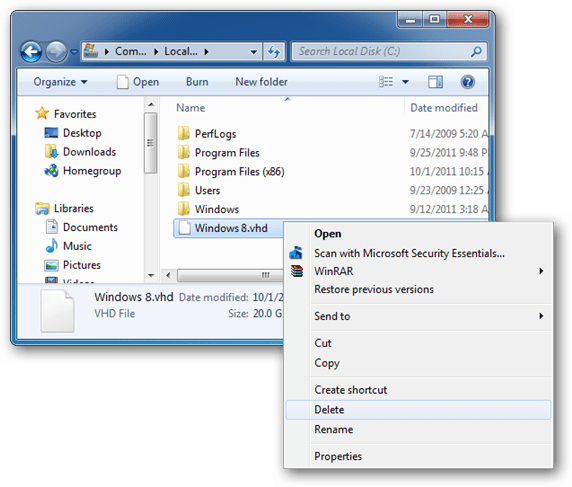 If you still aren’t sold on the new version of Windows, here’s how to remove it entirely. 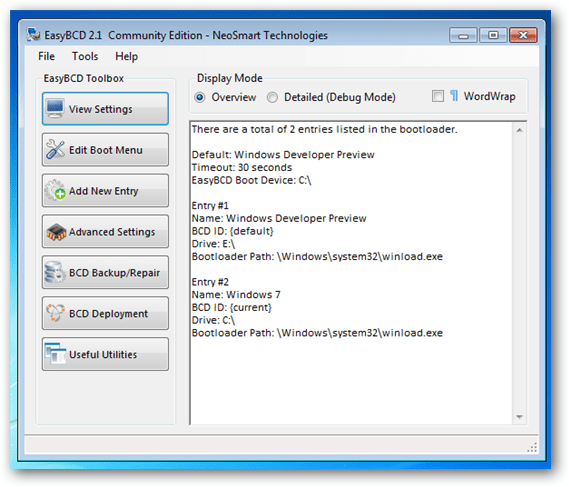 Note: We will be playing with the Boot Configuration Database in this guide, and as this is an integral part of the boot process you should follow this guide extremely carefully, or suffer the consequences, which will most likely be an unbootable PC. This guide also assumes that you have dual-booted according to our articles, and do not have any other operating systems besides Windows 7 and Windows 8 installed. Note: This section applies to everyone who wishes to uninstall Windows 8 from both the classic dual-booting method, as well as the VHD method. Since we will be removing Windows 8, the first thing you will need to do is boot into your Windows 7 instance. Now we could always use the command line to manipulate the BCD settings, but there is a much easier way using a tool called EasyBCD, so we will go that route. Once you have downloaded a copy, it’s an easy “next, next, finish” type of install. Once it has installed, go ahead and launch it. 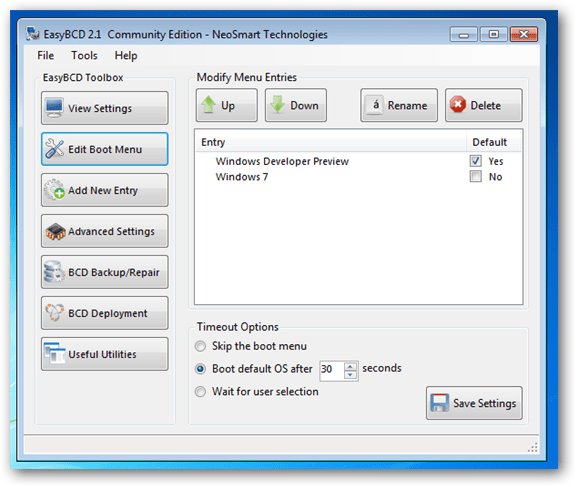 From here we need to delete Windows 8 from the Boot Configuration Database, on the left hand side you will see a button labeled “Edit Boot Menu” click it to get started. On the right hand side, there will be a list of all the boot loaders that your computer has been configured to use. Select the entry named “Windows Developer Preview” once you have it highlighted click the delete button. You will be prompted with a confirmation message, choose ‘”yes”. Now that Windows 7, is the only entry in the database. We need to set it as the default option. To do this select the check box, under the Default column. 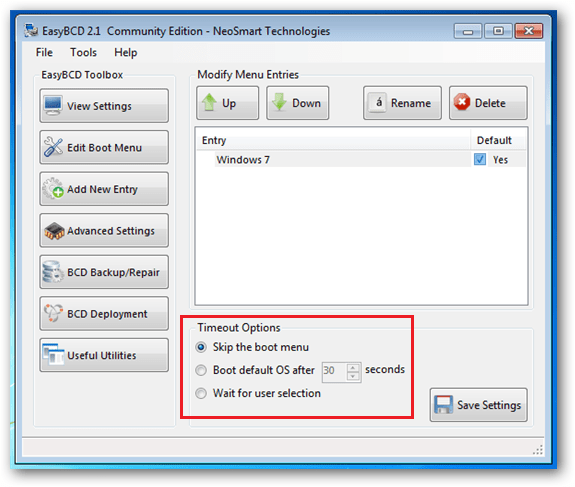 Since Windows 7 is going to be our only operating system, we should also select the radio button labeled “Skip the boot menu” under the Timeout Options. You can now click the Save Settings button. To check that the changes have been made, you should reboot, you should boot straight into Windows 7. Editors Note: From here depending on which method you used to dual-boot, the finishing touches will be different. If you used the classic method, the next section applies to you, if you used the VHD method skip to the last section. 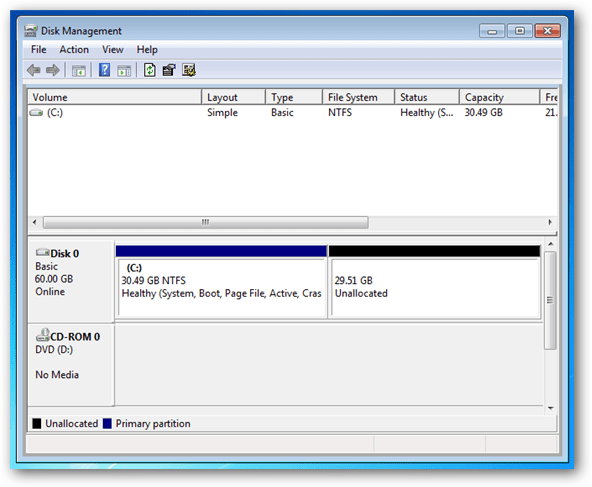 We still need to reclaim the space that your new partition stole. 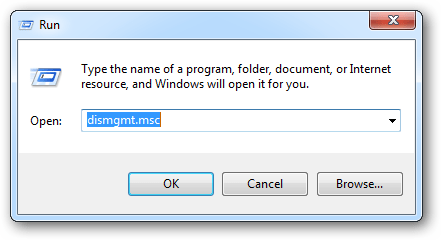 This can be done through the Disk Management MMC snap-in, to launch the snap-in press the Windows Key + R to launch a run box, type “diskmgmt.msc” into the run box. Note: After completing the following any information or data that you had in Windows 8 will be lost. When the Disk Management snap-in has loaded, we need to delete the volume on which Windows 8 resides. 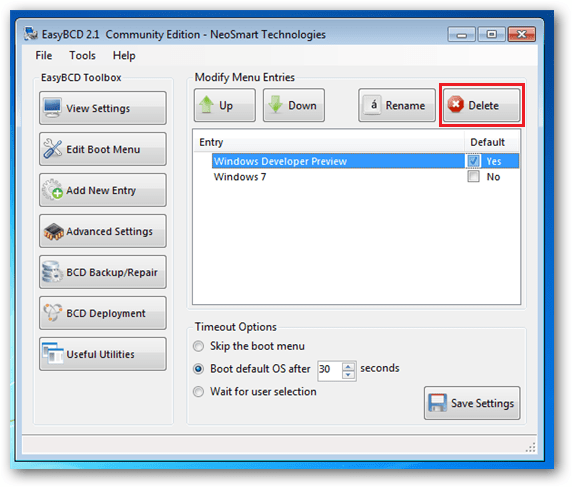 To do that right click on the drive in the list and click on the Delete Volume option in the context menu. You will be prompted and warned that all data will be lost, select yes to continue. You should now see that you have an empty partition denoted by its black header. Now right click on the the partition the partition with the blue header directly before it, and select Extend Volume from the context menu. This will open a wizard, you don’t have to change any settings so just click next, next, finish. Once you have completed that you PC will be back to how it was before. If the above method applied to you, this is where you stop, as the next section only applies to those of you who dual-booted using a VHD. The only thing that you have to do now is to delete the VHD File, from the root of your C:\ Drive.